The Torbay catchment has a complex network of drains and creeks that help to maintain viable farm land in much of the catchment, especially the lower section. 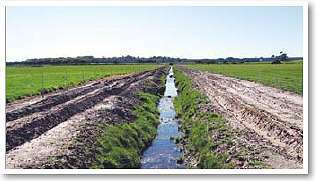 Unfortunately this drainage system has the potential to transport nutrients off farms and into the wetlands and estuaries, resulting in poor water quality and algal blooms. With careful fencing and planting landowners can greatly improve the functioning of these waterways. They can reduce erosion and sediment build-up, trap nutrients before they enter the waterway and provide corridors for the movement of wildlife. Trees and shrubs planted carefully around the property can also provide better growing conditions for adjacent pasture and provide shelter for stock. Take some time to get to know your site and see where the different waterway zones are, as this will determine the placement of plants. Natural waterways have a channel, banks, a floodway and a riparian fringe. While these also exist on artificial drains; the banks, floodway and fringe area may be greatly reduced. Consider reshaping drain banks to recreate a natural waterway. A gently sloping bank will reduce erosion and create areas to plant without negatively impacting on drainage. Decide where fences, crossings and watering points will be located. Incorporate meander bends and the floodway inside your revegetation site, this will provide better erosion control and help protect your fences from flood damage. The Natural Resource Management Officer with the Torbay Catchment Group can help you lay out your project and map it over an aerial photograph. This is also a good time to take some ‘before’ photographs so you can monitor progress at the site. Weed control is essential if your plants are to survive. Effective weed control prior to planting is the single most important factor in site preparation. 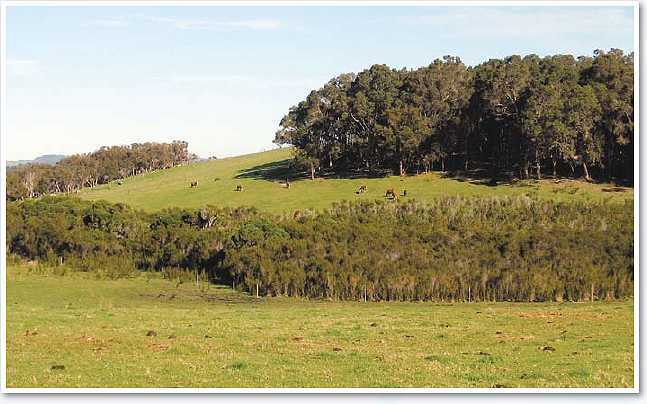 Weed control should extend beyond the revegetation area where it is adjacent to pasture. Create a weed-free buffer around your site to prevent the spread of creeping plants such as kikuyu. Spray all pasture grasses and weeds with a non-selective herbicide, 1% glyphosate is generally used. ‘Frogfriendly’ herbicides are preferred around wet areas. If you are planting among native plants you may decide to use a selective herbicide, such as Fusillade. Wherever possible rip and mound your site. Ripping is essential to break up the compacted ground, particularly if livestock has grazed the area previously. Mounding creates a pile of top soil that will elevate the plant above ground level and is essential for low lying country in winter wet areas. Ripping and mounding is done with a single pass on a tractor. This should be done when the weeds are dead and the soil is dry to avoid soil clods forming. Clods in the soil create a poor plant-growing environment and can lead to plant death from inadequate root/ soil contact. The rip lines are usually about 2-3m apart and follow the contours of the land. Ripper-mounders are available for hire if you have a tractor, otherwise a contractor can do the site preparation for you. After mounding or early rains you may get new weed germination. Spray this with a knockdown like glyphosate and include a residual herbicide to stop further weeds emerging. You must wait at least 2 weeks after using a residual herbicide before planting. Plant trees and shrubs from May to September, depending on how wet the site is or will get. Trees and shrubs are generally planted about 2.5m apart (if planting 1000 stems/ha). Sedges that go in or near the water should be planted in spring or summer, when the water level and velocity is lower. Plant a mixture of local shrubs and trees. The Torbay Catchment Group can give you advice on the plants best for your situation or order them for you. To ensure you get the species and numbers you want, it is best to order your plants in December or January. You may need to do follow up weed control for the first few years, especially if your initial control wasn’t great. A non-selective herbicide can be used to spot spray weeds, taking care to avoid the trees. A grass selective herbicide is a good way to control grasses while not harming the trees and shrubs, however it is more expensive. Plantings don’t have to be for traditional revegetation, you can integrate a cash crop with grazing. Agroforestry can provide a series of buffers across the landscape which can greatly improve water quality, help manage surplus groundwater, provide shelter for stock and create a beneficial environment for pasture growth. Make things easier on yourself and only construct your fence when two rounds of weed control and the ripping has been done. Local native plant species should always be chosen as they provide habitat for native birds and animals and are not a weed risk. 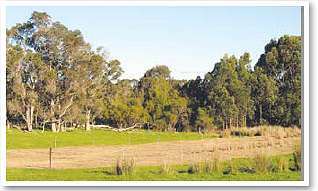 While there are a number of vegetation types in the catchment. as a general rule the following species are suitable for use along Torbay waterway and wetland revegetation projects. Fences should be set back from the main channel to provide an adequate buffer for riparian vegetation, water movement, fence protection and nutrient/sediment control. They should include the floodway and meander bends. Off creek watering points using troughs, soaks or dams should be used where possible. In some cases fenced, paved access points or crossings may be suitable. Crossings should be built to minimise their effect on water flow and erosion, so understanding how your waterway works is the first place to start. The Department of Water’s book ‘Crossing Creeks, Stream Crossing on Farms – Issues to consider in South Coast catchments’ is an excellent resource for this purpose. 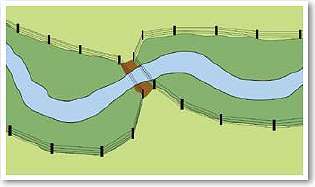 The Torbay Catchment Group can help with designing and financing crossings and alternate watering points as part of waterways fencing projects. They can also help you apply for funding through the Torbay Catchment Group. Ripper-mounders can be hired from the Wilson Inlet Catchment Committee (9851 2697), Wilsons Farm Machinery (98451132) or Stuart Young (9848 2075). If you need to borrow a spray unit the Torbay Catchment Group can lend you one. A number of spray contractors also work in the area.